Have I mentioned lately that Hungarian is hard? Very, very hard. But it’s also like a very trippy version of language Clue. A whodunit with what weapon in which room. Because understanding Hungarian is alllllllll about the endings. I’m going to give you the absolutely easiest example I can. This is a fairly easy sentence to create in English, even with a lower level of knowledge of verbs. I is making lunch? No. I making lunch? No. But do a little memorization of the forms and you get it: I make lunch. Furthermore, in English you signify indefinite/definite with the article: I make lunch. Or, I make THE lunch. But in Hungarian, you have to add endings to just about everything to signify not only person (I–first person singular) and tense (make—present) but also (lunch/the lunch—indefinite/definite) and (lunch—object). That’s a lot of endings to remember. I won’t mention them all now. It’s too depressing. And this is just for the Indicative. See how those endings changed? Indefinite: You make/made/will make lunch. Definite: You make/made/will make the lunch. 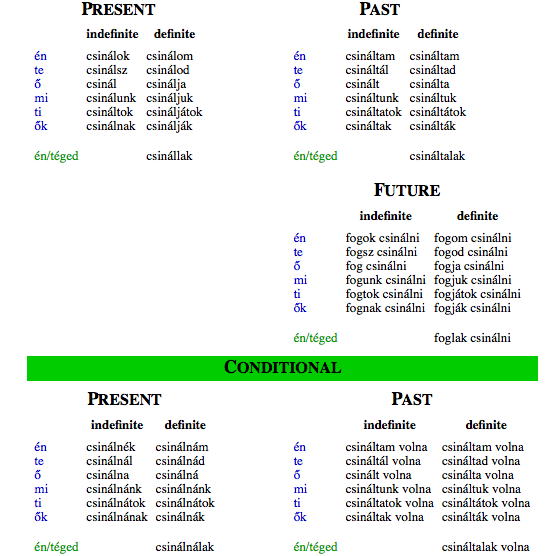 Eighth through twelfth grade I complained about conjugating Latin verbs. Oh, the endings, tear tear, pout pout. Ancient language and all, it’s easy to beat up on. I couldn’t see it then, but my punishment was coming. And it has arrived in the form of learning Hungarian. good luck, jes. you’re brave for learning and i commend you for not being the typical american and settling for only keeping the company of those who speak english. language is a difficult thing, but the light bulb will eventually pop! My Mom keeps saying this is going to help me – I don’t know how! Ohh, yes the irregular Latin verbs are not fun, but if you ever study another language, the systems of learning Latin are so incredibly helpful. I know it doesn’t feel like it now (and it didn’t to me at the time) but I’m glad that I learned it now. Also, just think of all of the people who you can say (when they complain about any language)– “Oh, I don’t want to hear it– I learned Latin” :)! Something I learned my senior year: Ego sum hodie apud te pransurus. I’m going to have lunch at your place today!! Hope all is well Alex. It’s so great to hear from you!! It’s sooo good to hear from you! I hope you are doing well. Did you see the new Family Guy? …I loved the Disney vision the most. It was sooo hillarious. I ‘m curious. At this point, living abroad for over a year, how comfortable are you speaking Hungarian? And understanding? Do you think that you are past the point where people automatically know you are American when you speak?